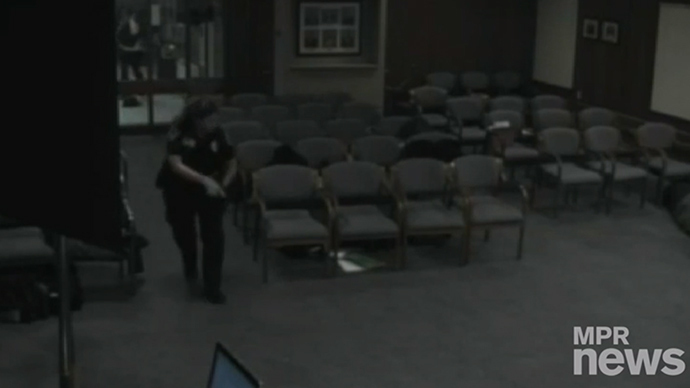 A gunman has opened fire during a law enforcement swearing-in ceremony at a city council meeting in a Minnesota town. Two police officers were injured and the gunman was fatally wounded. Authorities had yet to identify the name of the suspect as of Tuesday morning, but acknowledged that the man was killed when the officers returned fire inside New Hope City Hall outside of Minneapolis. The ceremony began at around 7 pm local time Monday, according to the Minneapolis Star Tribune, and the two new officers, Joshua Eernisse and Adam Johnson, were sworn in within the first 15 minutes. At around that time, the paper reported, the officers walked out of the chambers and encountered a man with a “long gun,” according to officials, who then opened fire. Video cameras were recording the swearing-in ceremony from inside of the chambers, and footage from there has since been recovered and published to the web. Footage from the room reveals that a council member was discussing a resolution when he was interrupted by a gunshot, then the warnings of another official. "Get down, get down, everybody get down,” someone off-screen is hearing yelling. “That went right through the door,” says the first official. New Hope City Council Member John Elder — a former police officer who currently works as a public information officer for the Minneapolis Police Department — is shown in the clip reacting to the uproar by drawing a handgun from behind his desk and ordering his colleagues to stay down. According to the LinkedIn profile purportedly registered to Elder, the councilmember has worked in law enforcement for at least 25 years. Elder and others present in the room were eventually escorted to safety nearby, according to the paper, and the two injured officers are expected to survive. New Hope is a town of roughly 21,000 people located 11 miles outside of Minneapolis.